The Asian Development Bank (ADB) said Wednesday (April 6, 2005) the Chinese economy is expected to land softly in 2005-2006 even as it continues to expand rapidly from 2005 to 2007, with growth rates expected to reach 8.5 percent, 8.7 percent, and 8.9 percent, in successive years. In a forecast report of economic trends, the ADB said that the fast growing Chinese economy is being reined in for a soft landing under the government's balanced development strategy and continued macroeconomic control policy. Despite a series of macroeconomic control measures taken in 2004 to dampen sectors considered to be overheated, economic growth last year accelerated to 9.5 percent, the highest level since 1997, the bank said. The bank said the growth rate of exports will slow because of easing demand in industrial nations and higher costs for China's exporters. "Manufacturing and construction, hampered by bottlenecks in energy and transportation, land constraints, and reduced levels of investment, also will slow," the forecast said. It said the industry sector is forecast to expand by 9.3-10.2 percent over the next three years. The sector of agriculture will grow by 3.0-4.6 percent a year in this period, reflecting government's efforts to support rural production and farmers' incomes. 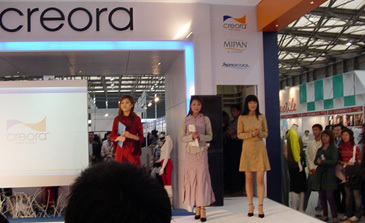 Fabrics Exhibition in Shanghai — Chinese models perform cat walks in a textile exhibition-related show at the International Exhibition Center of Shanghai. As more domestic service industries open to the outside world, an average 8 percent growth in the services sector is expected for 2005-2007. In addition to guiding its economy onto a more sustainable growth path, China also is working to fulfill commitments it made when joining the World Trade Organization in 2001, the bank said. In this regard, China has reached its goal of cutting trade tariffs, with the general tariff level lowered from 15.6 percent in 2001 to 10.1 percent in early 2005, according to the report. 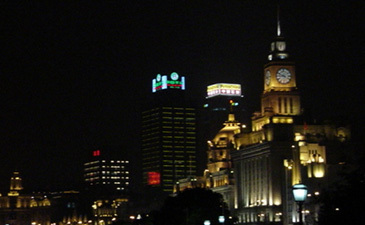 In services such as banking, insurance and securities, the China has met its WTO commitments on time. Over the past three years, the country has revised more than 2,300 national laws and regulations that ran counter to WTO rules," the forecast said. Among them are laws related to intellectual property rights protection, including trademarks, patents, copyrights and protection of computer software. However, enforcement of these laws remains difficult, according to the report. The report said China continued to be a favored destination for foreign investment, which rose by 13.3 percent to 60.6 billion US dollars in 2004. "Investors come partly for unskilled labor, which is about 4 percent of the cost in the US and one third of the cost in, for example, Malaysia," said the report. Moreover, the country's infrastructure continues to strengthen, and its business environment has improved significantly since it joined the WTO." Despite the forecast of a soft landing for the economy, significant challenges remain, the bank warned. Risks to the outlook include a possible return to extraordinarily high growth rates of investment, which could spark further overheating, it argued. "Conversely, the soft-landing scenario could be disrupted by potential problems that cause growth to slow more sharply than planned. The country must maintain rural income growth, stimulate development of small and medium-sized enterprises and speed up banking reforms," the report said.